The museum manages a small collection of objects that support our mission to champion the history of Amesbury’s industry and people. Currently, the collection is not on display. We are developing this web-based catalog to share our holdings and will continue to update this page. To review the museum’s collecting policy visit here. 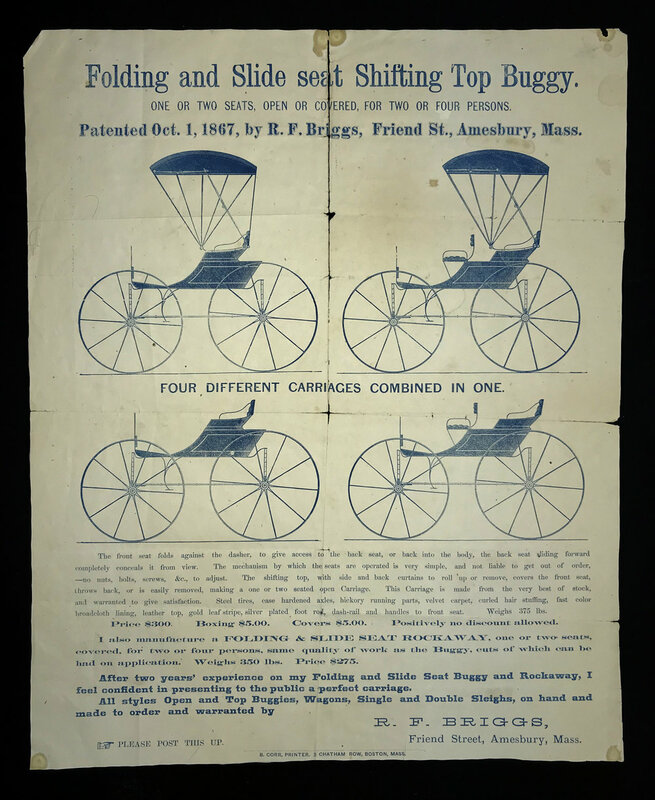 Thomas W. Lane began making carriages in Amesbury in 1874. This Concord buggy is a typical example of the company’s work – it is considered a “light” carriage and could only carry a couple passengers. The T.W. Lane Company produced the last carriage made in Amesbury in 1926. Built around 1850, this sleigh reflects the type of vehicles made in Portland, Maine, beginning in the early 1800s. This single-seat sleigh has wood runners with iron rims and a beautiful paint finish. Nathaniel Currier (1813 – 1888) of the famous Currier & Ives print-making company was probably the owner. Currier kept a vacation home on Lions Mouth Road in Amesbury.